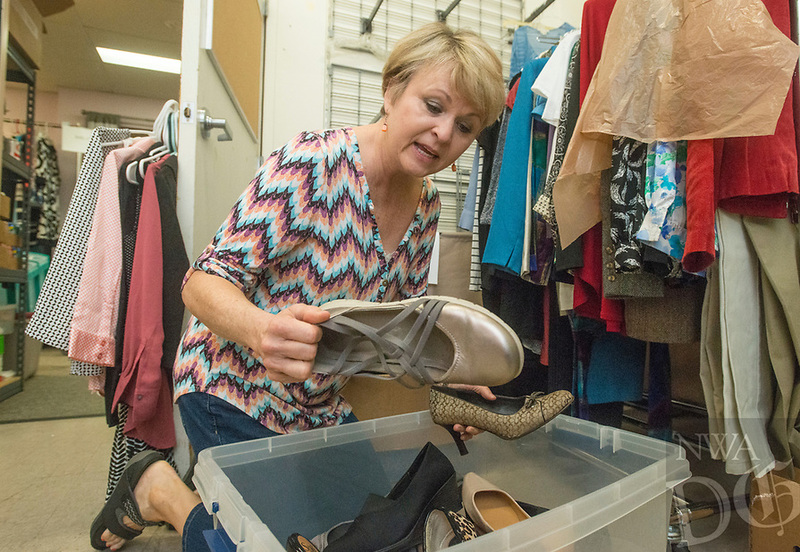 Gwen Shankle of Springdale, who volunteers as a image consultant, sorts donated shoes Saturday, Aug. 4, 2018, during a 'Suit Sorting Saturday' at Dress for Success Northwest Arkansas in Frisco Station Mall in Rogers. Dress for Success, with an additional boutique in Springdale, helps empower women entering the workforce by providing support, classes and appropriate professional attire free of charge. Their clients are referred to them from other area organizations, and include women trying to overcome poverty, new citizens and those returning to society after being incarcerated. Volunteers gather once a month at the Rogers location for a Suit Sorting Saturday to help with intake, sorting, cleaning and repair of donated clothing. The organization plans to hold their annual inventory reduction sale Aug. 25., which is open to the general public and helps fund the organization.